Personally I think if you pack light summer clothing for 3 days, then 1 warm pair of trousers, 1 Fleece or jumper, a thicker jacket (preferably weatherproof or waterproof lining outside) and 1 pair of warm socks with your other socks and underwear, you should be quite fine. Swimming gear is a must, and does not take up much space (most lodges stock towels, you will only need to pack your own towel if you are doing a camping safari). 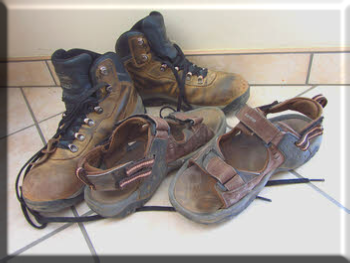 1 pair of good hiking shoes (which you can wear on the plane) and a pair of sandals is a must (which are small and light weight). A hat is always a good idea, but hats are available to buy in Namibia as well - most lodges stock hats in their shops. Your insect repellant and sunscreen is very important, but often these items are not allowed in the luggage, insect repellant and sunscreen can be bought at most supermarkets, pharmacies and convenience stores in Namibia. Shampoo, shower soap/gel, toothpaste and toothbrushes can also be bought in Namibia. Your camera charger, binoculars and other gear is up to you; and a small LED torch will always be a handy accessory. For charging your batteries, we use a 3 round pin plug in Namibia, and a round 2 pin adapter to go with it (220 V electricity). 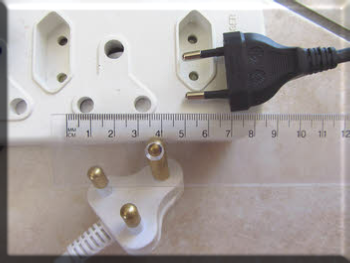 The adapters can also be bought in Namibia. Most accommodations offer a laundry service, so on average you can hand in laundry every 2-3 days. Strange that these factors never really came to my attention before I was a guide. I have learned that we have become so accustomed to climate control, that if some people are taken away from it they truly suffer. My best tours and guests were the ones who took the weather as it came. If you know that you have a real problem with heat, don’t come in summer, if you have a real problem with cold, don’t come in winter. A lot of lodges make use of generator, or even solar power, and these cannot sustain air conditioners yet. True cold we only have for about 2 to 3 months of the year, therefore most lodges are better equipped for the hot months. But most also gives really good duvets in winter... And some even Ice in their Gin&Tonic in summer! Very sunny to extreme thunderclouds, with a possible patch of mist, rain or occasional ice. On a more serious note: OUR AVERAGE WEATHER TEMPERATURES ranges from -2C to +26C in winter, +22C to +38C in summer. It also depends if you are in the Caprivi, Sossusvlei or at the coast (which is rather cool) and our biggest winter weather change factor are the cold fronts coming from the South. It is often really chilly for 3 days, then the wind howls for 2 days, then it is really pleasant again for 4 days or so until the next cold front comes in. Our main rain season is between Mid January and Mid May, although last year we have still had thunder in Windhoek on the 11th July! Also a yet unexplained phenomena is that often (even on a day that was not tiring) people feel tired and agitated without reason, take care, this can be due to sudden pressure changes. Because of our topography we do get very sudden pressure changes, and I see all the time how they affect people. Be really careful, if you are feeling down without reason, try not to blame it on yourself, there could have been a weather change that makes people naturally agitated, irritated, tired or even angry. Most often I see this happening on a day driving from Sossusvlei to Swakopmund, or from Windhoek (1650m high) down to Swakop. These you can freely blame on the weather without my strong comments... Combine a long day and a lot of driving with a pressure change and that is most often where arguments and fights break out that would not normally happen... Remember: Pressure changes affects us all. All in all, the weather in Namibia is not THAT bad, most days are really enjoyable.